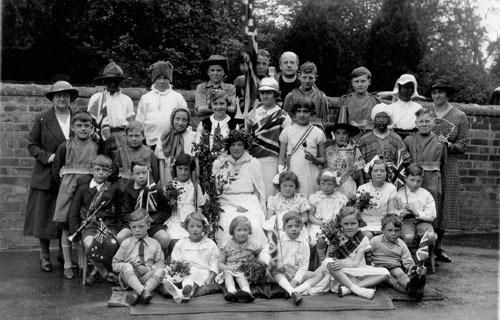 The photograph below shows Thurgarton school celebrating Empire Day in 1937. The school had 30 pupils and two teachers in 1937 but within a short time the village and its school would play host to a large influx of evacuees.This article tells the story of the village and its evacuees two of whom have left a record of their memories of life in wartime Thurgarton. Prominent in their accounts are the school’s headmistress Mrs Beech (far left) and her assistant teacher Miss Fletcher (far right) and the vicar, Rev. Halstead (centre back row). In the 1930s the threat of war and the fear of urban bombing drove the government to prepare detailed plans for the mass evacuation of major British cities and towns. The plan, code named ‘Pied Piper’, was prepared well in advance of the outbreak of war and the order for evacuation was given on the last day of August 1939, 3 days before the declaration of war with Germany. Within the week nearly 3 million children with 100,000 guardians (mostly teachers) were dispersed by coach and train into the countryside. Given the scale and speed of ‘Pied Piper’ some confusion was inevitable but it was undeniably a triumph of logistical planning. Newspaper reports describe cheerful parents and excited children but such propaganda hid the truth of the trauma of painful family separations. Children some as young as four underwent a lottery of fostering. Many evacuees have told their stories; some describe years of abuse and misery but others recall happier times – of an idyllic English village childhood. On 4th September 1939, nearly forty evacuees from Sheffield arrived in Thurgarton. The school log book for 13th September records the new school enrolment as – children from Thurgarton 28, Sheffield 22 and Nottingham 2 with two extra teachers from Sheffield. The immediate threat of mass bombing did not materialise and many of these early evacuees went home – only 7 children from Sheffield remained at Thurgarton. However the threat became all too real after the fall of France in June 1940 and a further wave of evacuation brought 18 children and 1 teacher from Southend to Thurgarton. The school log book for the 3rd June 1940 records their arrival and billeting. On 5th June the school reopened and all new children underwent medicals which included the inevitable search for nits. The enrolment lists 43 children -from Thurgarton 16, Nottingham 2, Sheffield 7, Southend 18.- most were to spend the next three years in the village. Two evacuees from Southend, Ken Lambert and Gladys Totman, have recorded memories of their time in Thurgarton and what follows are edited extracts from their memoirs. In June 1940 my brother Peter and I were taken by our parents to Wentworth Road School in Southend to board a double-decker Corporation bus. Our names were pinned on us, we were given a gas mask in a cardboard box, a small bundle of clothes, and a bag of sandwiches. Our parents waved a tearful farewell and off we went to the Central Railway Station. All we knew was that we were going somewhere safe away from Hitler and his bombs; we didn’t know where, neither did our parents, and our teachers were not allowed to say. To me it was an adventure. In the evening we arrived at Southwell Station and were surprised to see chickens running on the platform. There seemed to be hundreds of children from all over Southend. We were taken to different parts of Nottinghamshire and what a strange place it seemed. People spoke differently, narrow hilly country roads, farms (never seen a farm before) and mini-towns called ‘villages’. There was no village name sign – they had all been taken down throughout the country so Hitler would get lost. At last we found ourselves in Thurgarton C of E School and were lined up in the playground and the billeting officers arranged with the village folk to take us into their houses. Peter and I were taken in by Mr and Mrs Perkins who lived in Bleasby Road. What a strange house*. It was long and narrow built on the edge of the road and appeared to have no windows – until we had gone round the back , which was the front of the house. There was a big garden at the back of the house and a large orchard with tall stinging nettles. There were pigs and chickens and Mrs Perkins took us to feed them each morning before going to school. We didn’t see much of Mr Perkins who worked very long days, six days a week, looking after the village hedges and ditches. Mrs Perkins tried very hard to look after us but I am afraid we proved too much of a handful and we had to move on. She was very upset. She was a lovely person and always took an interest in us right up to her death in 1972. We were taken in by Mr and Mrs Atkin who lived at Hill Farm Cottages and had three daughters and a son. The oldest daughter was a teacher in Nottingham and married with a daughter – they visited each month and brought some sweets. The second daughter Lily lived at home. She was a dressmaker and looked after us; she spent a lot of time taking us for walks, blackberry picking, collecting dead wood, feeding chickens and supervising all the daily tasks we had to do. At potato picking we would hide some big ones in the hedge which we collected later and baked on a fire. The youngest daughter, Kath, was a dashing young lady in army uniform; on leave visits she used to make us jump “ Come on you lads, get cracking” –and we did. The son Bill was a prisoner of war**. I’ll never forget Mrs Atkin waiting for the post lady for news of her son. We could see and sense her pain as time passed by but the brave lady always had a smile for everyone. She worked fit to drop and only ever seemed to leave the farm on Sunday morning to go with us to church. I liked Mrs Beech the headmistress and Miss Fletcher; the school was so crowded that we often had lessons in the barn in the farmyard next to the Coach and Horses. Mrs Beech was the church organist and we joined the choir – this was our first time in a church or in a choir. Out parents came to see us with our baby sister Betty born in July 1940. Someone lent us an old large doll’s pram and my sister was taken around the village in it. After my parents left one of the village girls teased me about my sister being in a doll’s pram and I was rude to her – to my cost. Mrs Beech gave me the cane on my backside in the playground in front of all the children. I don’t think it did me any harm. In the summer of 1943 our father took us home to Southend. I didn’t really want to go but my father and mother wanted to be a complete family again. On our return we were shocked to find the schools were closed. Many more air raids took place with many nights spent in underground shelters. All the empty houses in the streets filled with troops ready for D-day. At the end of the war the town came alive, the lights came on again and the Pier and the Amusement Park were handed back by the Navy and the beaches reopened. Evacuation from Southend, June 1940. There were many tearful partings. I was desperate not to go but had strict orders to look after my baby sister who was not quite 5 years old –I was 7. It was a big responsibility especially as we had no idea where we were going. We boarded the train in Southend at 10am and after a long journey got off somewhere in the Midlands and were dispersed by coach to various villages – our destination being Thurgarton. 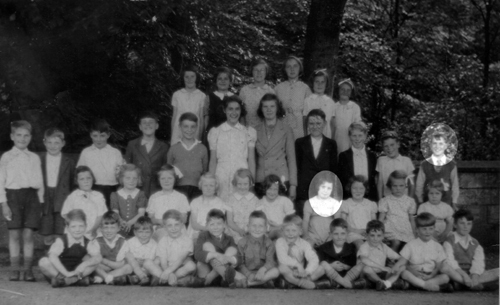 We were assembled in the village school where the billeting officers handed us over to the people who would be our foster families for the duration of the war. My sister and I were allocated to Henry and Mary Poole (Hill Farm cottages) who had two children of their own, Jean and Kenneth. On that Sunday the child population of Hill Farm grew from four to eleven. The farm was sheer paradise for us. There was always something going on – new calves and lambs, pink silky piglets in an old galvanised bath in front of the kitchen range, hunting free range eggs and picking plate sized field mushrooms or blue buttons on late autumn mornings. We were all included in the farm activities such as haymaking, harvest, potato picking gathering blackberries, sloes and hazelnuts. At harvest time there was a school holiday and we all joined in; we rode on the huge carts which were fitted with extra attachments front and back to increase the loads. We carried big baskets of bread , cheese, apples and cold tea in quart beer bottles up to the men who worked in the fields well into the dusk. Acorns were collected by the sackfull to supplement the pig’s diet and rose hips to make syrup for vitamin C. Once a year a pig was killed for food for the farm folk and other food sources included pigeon, rabbit, chicken, eggs, butter and cream and any amount of apples, pears , plums and damsons. We didn’t have sweets but didn’t miss them. The head mistress was Mrs Beech, she was also the billeting officer and church organist. Miss E Fletcher taught the infants and juniors. There were only two classrooms at St. Peter’s School which were full for most of the war but we got as good an education as one could expect. At school cricket and rounders were played and conkers were very popular and there were many heated contests in the school playground. The beck was a great place to catch minnows, sticklebacks and bullhead . In winter the stream was wild as the water boiled down from the hills bringing all sorts of debris. In summer we would pass through the schoolyard gate onto the path along the beck and pick fresh watercress from the clear water. Further down there were stepping-stones and the middle stone was wobbly and quite a few of us got an unexpected paddle. At school both girls and boys were taught to knit gloves and scarves for the troops as well as embroidery for the Red Cross. We also raised money with plays and concerts -we all had to help with the war effort. Friday afternoon was a treat with Mrs Beech reading from The Wind in the Willows or Little Lord Fountleroy etc. and her voice would get decidedly croaky in the sad places and her hanky was in use on many occasions. Yet she would weald the cane when necessary. Mr McLean the dentist visited twice a year to sort out our teeth. He parked his mobile surgery ( a converted showman’s caravan) in the field behind Bentley’s farm. Once or twice a horsebox shaped vehicle arrived and parked opposite the school. We were taken in groups and put inside and told to wear our gas masks and then after the gas was released we had to take them off. I don’t remember how long each session took but only the children went in, none of the adults. We didn’t appear to suffer any ill effects. St. Peter’s church with Thurgarton Priory in 1940s. We all went to church on Sunday. 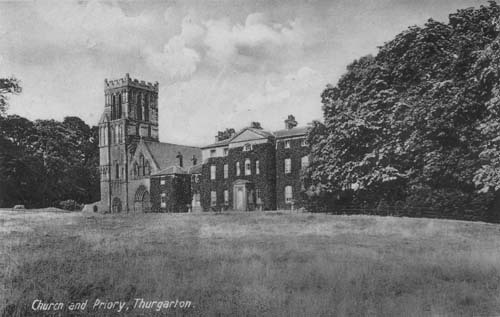 The Priory next to the church was a convalescent home for wounded troops, Mrs Ransome lived there with a team of nurses. The troops filed into the front two pews of the church through the connecting door to the house. Mrs Beech the headmistress was the church organist and we all joined the choir. The vicar, Mr Hallstead, was a real Bible thumper, more of a hellfire evangelist. I don’t know if he realised how we choristers took the mickey but he was a bit short and needed a wooden box to stand on to see over the pulpit. We used to chew our Psalm sheets into soggy balls of paper and catapult them at the convalescent troops – it broke up the monotony of the sermon. During our time at the farm I believe Coventry was badly bombed. I remember being taken from our beds downstairs to see the red glow in the sky – it seemed to burn for days. We had a dreadful fright one day on the way home from school, we had just turned up the long lane to the farm when we saw a parachutist coming down – we thought the invasion had begun. All the men ran across the fields with anything to hand as a weapon to catch him. To this day I don’t know if he was caught. I had nightmares for weeks and started sleepwalking again. In 1943/4 the kids were all agog when a team of American/ Canadians spent a few weeks test drilling for oil in a field behind Kathleen’s cottage – there is still a capped test hole there. Later in the war a bomber crashed just outside the village, it had a full load of bombs and all the crew were killed. It was double summer time and both pubs were busy. The plane flew over, it sounded in trouble and then there was a huge explosion and the whole place shook. The pubs emptied in record time and the men ran up the drive to the Priory then across the fields to where a column of black smoke was rising. From snippets we heard it was very gruesome and a woman in a nearby cottage who had just given birth was saved because the blast went the opposite way. We were supposed to be in bed but with all the disturbances we sneaked downstairs and peered round the blackout curtains – we saw such a black cloud. In 1942 the Pooles retired from farming and sold Hill Farm to Boots. We were all sad to leave the farm, some children went home to Southend but I and my sister were rehoused in separate homes in the village. I moved into the schoolhouse with Mrs (Gran) Webb, she had taken in many evacuees and had a scroll from the Queen praising her for her care. The schoolhouse had one living room with a black range, a narrow kitchen, a pantry under the stairs and a dormer bedroom in which slept Kathy Povey, Stella and Shirley Swainson and myself. Gran taught us how to look after our clothes, to darn, sew on buttons and mend tears. She was not a young woman but she knitted garments to order including knitted stockings for the Miss Players of Nottingham (of the tobacco family) and the altar cloths for the church. We all had chores to do for Gran. Before school we made the beds, washed up, peeled potatoes and once a week polished all the brasses and cutlery. Friday night was bath night in a tub in front of the fire. Gran took the News of the World every Sunday, she always did the crossword and fashion competitions but never won. We were allowed to read the music page where words and music were printed of the hits of the day. By Monday the newspaper had been cut into squares and relegated to the outside toilet threaded on a string on a nail. Not many houses had indoor toilets and by today’s standards the toilets were very primitive but surprisingly clean and hygienic – everything smelt of Jeyes Fluid. There were many springs in the village – Granny Webb used water from her spring to bathe her eyes with a mixture of water and boracic to keep her sight clear for her knitting and crochet. Granny Webb would join her friends for a Guinness now and then either at the Red Lion or the Coach and Horses. There were two walnut trees in the field opposite the Priory, we collected quite a few to take home but Granny Webb said we were ‘scrumping’ but she kept our secret because she loved them as much as we did. The dye from the green skins was a dead giveaway, it stained our hands dark brown and we were scared that Freddy Sharpe’s dad would see them- he was a special constable and we had a healthy respect for the law. Granny Webb had a piano which we girls learned to play. It was used for all the functions in the village hall (the Hut ) being transported in Percy Fletcher’s trap down Bleasby Road with many volunteers pulling between the shafts. When we were separated my sister went to the Fletchers on Bleasby Rd where she was well cared for but for some unknown reason was moved on to one of the cottages next to the Coach and Horses. The cottage was overrun with cockroaches and they kept a pet hedgehog to eat them, they also had several tomcats which made the house stink. My father was in the RAF at Redcar and would call in regularly to see us. He was appalled when he next saw my sister – she was grimy, had a whitlow and a tooth hanging by a thread. He confronted Mrs Beech the billeting officer and created quite a stir. Every time my parents visited they would ask if we wanted to go home but the magic of the village was still alive and we stayed. By the time I had my 11th birthday in January 1944 I started to feel the need to go home. Mum and dad had moved into a 3-bedroom semi with indoor plumbing. The number of children at school was dwindling, the older children left and whole families were moving away. The journey home to Southend was very strange, the train was jam packed with every allied nationality in uniform- I’ve never seen so many people rushing about. We stayed overnight in London and experienced our first air raid and saw bomb damaged buildings. We had a new school and for the first few weeks were teased about our accents – it was very daunting going to a large suburban school after years in a two class village school. The strange thing was that we were 12 months ahead with our lessons. We were now a complete family for the first time for 5 years – it took some getting used to. Both Ken and Gladys revisited Thurgarton many times and along with many other evacuees kept in touch with the village families such as the Atkins below. * Sunnycroft Cottage , Bleasby Road – one of the oldest cottages in the village. ** Bill Atkin of the Sherwood Foresters was captured in Norway in 1940 and came home to a village celebration in 1945. The school children lined up in the playground to cheer him home as he marched down Beck Street from the station. Later over 200 villagers formally welcomed him home and celebrated with a day of games and a tea of cakes, strawberries and ice cream. Ken Lambert’s memoirs are a brief account (3 pages) and a full copy is available from this site on request. Gladys Knight nee Totman wrote over 35 pages and a full copy is available at the Nottinghamshire Archives Office (NAO) reference DD 2042/2/1. The Thurgarton School Log 1913 – 52 can also be found at NAO reference SL 170/1/1. Very touching account of the evacuee children. Beautiful photos. I think this article is very interesting and in some ways takes us back, although we were much younger. Very well put together article. I found these personal stories with lots of human interest really very interesting. It was great reading this article, Ken Lambert was my Dad! Sadly he passed away in 2009 but he’d always talked fondly of his time in Thurgaton and brought me to see Lily and Kath at Hill Top many a time, before they passed away. It’d be great to read his full account of his time there, if possible, thanks, Anne.